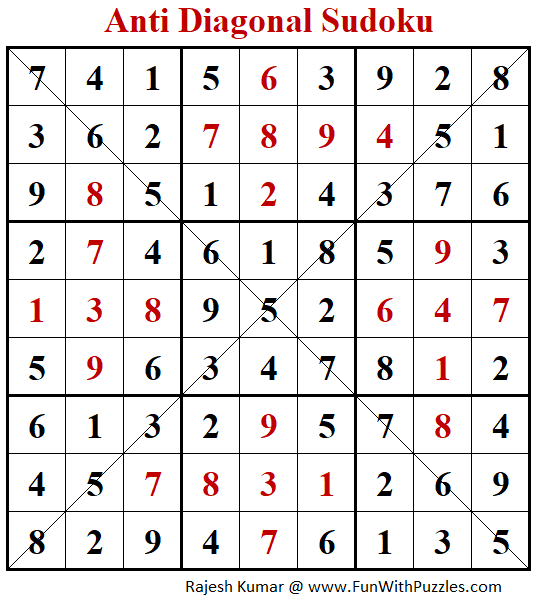 There is Diagonal Sudoku puzzle which is very standard Sudoku type. Diagonal Sudoku puzzle type is very famous Sudoku Variation. There is another similar looking but entirely different Sudoku type called Anti-Diagonal Sudoku puzzle in which same three digits repeat on the diagonals in each box. Here is Anti-Diagonal Sudoku Puzzle which I created for Player Vs. Player (PvP) Sudoku Competition during World Sudoku Championship 2017. 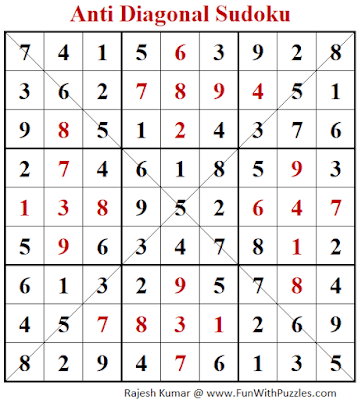 This Anti-Diagonal Sudoku puzzle, is last Sudoku variations which was used in PvP Sudoku competition. Other puzzles used were Classic Sudoku puzzles which I will published later. Currently this Anti-Diagonal Sudoku puzzle, I am publishing as part of Fun With Sudoku Series as 304th Sudoku Puzzle in this Series. I tried to created this Anti-Diagonal Sudoku puzzle with theme of letter "T". However the puzzle was not uniquely solvable and I needed to add few more digits. So I added one more digit to each "T" to make the theme as Cross symbol. I am publishing this Anti-Diagonal Sudoku Puzzle as #304th Sudoku puzzle in Fun With Sudoku Series. Here are the next are previous Sudoku puzzles published in this series.